Struggling with the study process? Some study methods work, others don’t. You need to know the difference and have a specific approach when you sit down to study each day. Start by reading the “31 Tips” Guide. Most candidates don’t have 4-5 hours a day to sit with their review course. Reviewing from your phone in small chunks helps solidify the concepts in your memory and make up lost study time. It’s easy to get lost in the sea of information from your review course. Our study supplements make things clear and easy to understand, while still providing excellent coverage of the topics. 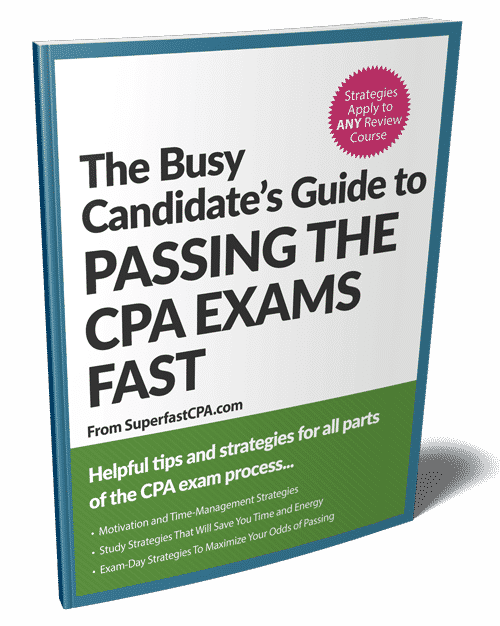 SuperfastCPA provides CPA exam review notes, study supplements, and advanced study strategies to help busy candidates pass the CPA exams faster. Here's how can help you: After trying the "normal way" of studying for a few months and failing FAR, Nate came up with his own study methods and then passed all 4 sections in 3 months. The SuperfastCPA strategies are based on these study methods. If you struggle with overwhelm and frustration during your daily study sessions, get our Study Hacks course. It will give you an exact framework for your daily study sessions that will help you blow through lessons faster, feel motivated each day instead of exhausted, and retain everything you've studied up until exam day so you can pass the exams and get them over with. Get our review notes and read them on your phone whenever you have a few spare minutes. Read while you're eating breakfast, lunch, and dinner... while you're walking to the restroom or waiting in line. We wrote them specifically for these moments so that you can pull them out and learn in short bursts without needing scratch paper to work out examples. Use our audio notes whenever you're doing something else such as riding the bus, commuting, working out, etc. These 'mini-sessions' throughout your day will pay huge dividends on test day, and it's exactly why we've created these study supplements for you. This was my third attempt at FAR. The first one I don’t count because I really didn’t study. The second was in 2010 and I got a 74 and I basically just gave up. I got my graduate degree in 2005 so my education was really outdated. I started and stopped and started studying so many times I can’t count them. I bought Wiley, and eventually Becker. I needed just enough to pass and that’s what Nate’s program gave me. I listened to the audio every day to and from work. I concentrated on just what he said to and no more. When he says really study, do just that, go to a place where there are no distractions, a college library is the best. I am an early riser so I studied in the morning and if I didn’t get to study in the evening, I didn’t beat myself up over it. I still had a life. I remembered more than I thought I could on exam day. I passed FAR with a 78. By the way, I work full time, I am married and a grandmother. If I can do it with my full schedule and my age, anyone can! I bumped into Superfast CPA after I had picked my review course and scheduled both REG and FAR. After listening to the initial prep and scheduling advice I knew I had scheduled my tests in the wrong order but I felt motivated and focused after listening to the sections. Thanks to the study strategies I passed REG with an 81. Simply put, it works. For me, the key to Superfast CPA is the inspiration it brings when studying gets long and boring. The methods provide focus and enhance the way you study- studying to the test, not trying to master all the material and how to practice time management for the exam. The point made that studying the hardest sections has diminishing returns was really eye opening for me. It makes perfect sense,and really helped me succeed. Suddenly the mountain didn't seem so large and scary anymore. After passing REG and starting on FAR I started to get overwhelmed again and listened to the "finding your why" again it has continued to inspire me. "These CPA exam review notes are VERY well-organized and concise. Many of the expensive review materials go into unnecessary detail that is difficult to understand, yet these notes do an amazing job of providing an outline of all the the major topics and their 'must-know' areas covered in FAR. I am currently using these notes to help me paint a clearer picture for my re-study of FAR and it is a HUGE help to see everything organized so well. I would highly recommend these notes to anyone who is having trouble understanding the "big picture" of the FAR topics and for those who struggle with notes from review courses that are written in complicated terms." These notes were fantastic. I honestly feel like I learned and actually understood the notes more than I did when I was reading my 900+ page review book that I purchased. When I purchased my review book, just looking at the table of contents I was so overwhelmed but when I looked at the table of contents in your notes, I didn't feel discouraged or like there was way too much reading I had to do. The sections were manageable. I truly felt like wow these sections are doable and I can definitely knock them out A LOT faster then I could with my review book. And the best part was I could read an entire section and I knew exactly what I just learned unlike reading a page or two in the review book, with small print and have no idea what I just read. I can't wait until the other 3 sections notes because I feel confident that these notes will really push my studying up to the next level! I have found the Superfast CPA FAR notes to be extremely helpful. The information is very condensed and focuses on the main points. It is a great supplement to the study course I am using and is nice to have for quick review when I am at work. I would recommend these to everyone. "These FAR review notes are awesome! They're short, to the point and have little extra details that some other mainstream CPA review course materials don't have. Also, these notes really cut out the extra fluff that's present in some more popular CPA review courses. It's a good thing it has included the info for the small business accounting, i.e. small GAAP, the newly liquidation accounting and most importantly IFRS rules that's definitely on the CPA exam. I like the fact that these SuperFastCPA Review notes has a lot of space to write any extra notes we see fit to help us understand the material better. These notes are definitely recommended as a supplement anyone's studies in learning the material quickly and efficiently!" The Superfast CPA Review Notes are a great framework in following the CPA prep course I am working with. It aides in giving an overview before potentially diving into further realms of the material. I wish I had this earlier as it would have made the Financial Statement Accounts and Specific Transactions sections easily understandable. I certainly recommend it as a tool in guiding your way through preparing for one of the biggest hurdles to becoming licensed. I was desperate after my second failed exam. My first (BEC) I had a decent score (still a fail), and thought I could pass the next time around as long as I did the same thing, maybe just spending a few more hours watching lectures and going over all my notes. But then taking and failing FAR miserably a couple months later proved that I had no structure in my study strategy and I needed some serious help. A few colleagues said I should switch materials.. but I couldn't spend a lot of money on a new study program. I didn't think that would help me any more than the one I had now anyway. I thought I understood the concepts and could memorize things well but I had no idea how much time I was wasting and spinning my wheels with studying the way the program had laid out (watch a lecture, take notes, underline this, highlight that, do a few MCQs). I found the SuperFast CPA online and I thought, "what could I lose?" and tried it out. I took FAR 8 weeks after I bought the program and strictly followed its guidance and was able to raise my score by 20 points. Not only were my study sessions shorter, but they were more efficient and I quickly gained confidence in taking practice tests and managing my time. This system really does work. Now looking towards Nate's notes, he outlines the concepts in a concise format, in plain English. They are easy to follow and understand. Sometimes, the textbooks can be overwhelming with a lot of information you don't necessarily need to pass the exam, and confusing at the same time. You also spend a lot of time sifting through it all to find the info you need for a particular question. I've been able to hop over to Nate's notes and get the quick rundown, and still get the MCQs concerning that specific info correct. I've looked at other published notes as well, and I would say in comparison to Nate's they are very basic, and I find I'm just memorizing words rather than concept as a whole. Nate's outlines are more in-depth but simple, quick references that help me understand concepts from a different perspective. These CPA exam review notes helped me review the key points from each chapter. The notes are easy to read and understand which helps you remember it better. It is a great material to review and good to use with different CPA materials that you are using. It contains thorough details in condensed language. Overall, it is a great tool to use. My experience with Super fast CPA has been excellent so far. I ordered Superfast CPA a few weeks ago and it was delivered immediately and I was able to access it within minutes. I found some of the studying tips and tricks to be a Godsend. I have experienced many of the problems and tribulations that Nate had in his experience with studying for the exam. I have been studying for the CPA without much help or peer support so my journey thus far has been misguided and difficult. Upon studying the way Nate outlined in his program, I felt much more qualified and prepared. I can confidently say that by using Nate's program my study time has been reduced dramatically. Thanks Nate, I will absolutely continue to return to your program for the remainder of my time studying for the different parts of the exam. After studying the way Nate outlined, I was able to reduce my time for studying. Case in point, I studied for audit for 1 month and 10 days from start to finish before taking it. I haven't received my scores yet. I'm confident the other parts will be expedited as well. The notes that Nate has created for FAR are excellent! I am currently using the notes to study for FAR again and have found that the notes have helped me to grasp certain topics that I had previously found to be difficult. I really like the organized style of the notes. The list format is easy-to-read and concise. I am currently using the notes as a supplement to my review course. If I am unclear about a topic as I go through my review questions, I now go to the notes for help on getting the “big picture” of the topic. My plan is to constantly re-read these notes and do non-stop multiple choice questions. I am confident that this time around, I will get a passing score. I am very happy that I have found out about these notes and only wish I had something like this sooner. Thanks Nate! "Nate did a fantastic job telling us how to correctly study for the CPA exam. I have been studying from Nate notes for the CPA exam, and I feel like I am really understanding the material better than I was before. Following his tips and notes combined made CPA preparation so easy. Now, I have more confidence in myself that I will be able to pass the CPA exam a lot faster after hearing Nate's lectures and reading his notes. He really knows what he's talking about!" Nate, the review notes on far are....so amazing. I love it man. I don't even know where to start, it's literally a work of art how you add just enough info but don’t jump too far. I'm on page 35 and going strong. After spending time reading your notes, I love the way you organized and structured the materials in the most easiest way to read and understand. It is short, simple, straight to the point, but detail enough to help me review some info I missed when I learned in school. I also like examples you added into it to illustrate some complex information as well. Keep up the good work! WOW! The "Superfast CPA FAR notes," are exceptional! They balance perfectly between being informative and condensed . The concepts and materials are clearly defined in a way that is easy to comprehend. I have used notes from other CPA study programs and I feel that the "Superfast CPA Notes," have been the best. I use the FAR notes before studying each section, and reread them immediately after completing a testlet. It is my guide and reassures me that it's ok to not understand everything. I have even used some of the bullet points and converted them to flash cards. I recommend getting the notes. I would without a doubt recommend these notes to my friends who are studying for the exam. At first, reading them was like reading an organized version of my "study questions I got wrong" notes, which is great in and of itself, but it got better! These notes are not only organized, but are also complete and concise; there's no filler content. An added bonus is how the notes helped me focus on how much of each of the five topics is generally covered on the exam, as opposed to the "I must know everything about every topic that is put in front of me" mindset, which can be easy to creep into. Great product! It is refreshing to finally find someone who gets it. I have been struggling for a long time with the exam and I get caught up in the details; well, useless and convoluted details. You cut through the fluff and offer what I think is hands-down one of the best tools out there to help bridge the gap between pass and fail. I have more motivation now than ever now, that I can pass! Thank you, Nate, for your FAR notes. They are really helpful. I'm such a kind of person who hates to spend much time reading the material. At the same time, I learn everything better by reading, I think. Your notes save much time and provide all accumulative information regarding FAR course preparation. I'm just half way of my FAR preparation, but with these notes I start doing much faster. Thank you. The review notes have been a tremendous help. Given that it is still busy season, these notes have been a great supplement to the study material as they highlight many of the core concepts and can be easily read "on-the-go".Using the notes in addition to the Superfast CPA study tips has been key to really cementing the fundamental CPA concepts. Overall, I would recommend reading the Superfast FAR notes to those who have a lot to cover in a very limited amount of time. Furthermore, your study tips and notes have helped increase the effectiveness of my study time since I now know which areas to dedicate the greatest amount of focus to and reduce the time I spend passively studying. I found the review notes easy to read and very well organized. They are a great summary of all the FAR concepts which I need to know for the FAR exam. I am very confident that your notes will help me to pass the FAR exam. The FAR notes were awesome. I really like it how they are clear and concise which really help make the topics easy to understand. I will definitely be using them as a supplement to my current CPA review materials as well as keep them as a future reference to my career. After reading the FAR notes, I have come to a conclusion that these notes have 3 important benefits. It is easy to understand, in depth and straight to the point (which is what we want as a studious individual), and the notes keep the points fresh in your mind. I am a strong visual learner and notes that are condensed have been very helpful in my focus of studying and keeps me in line with my study habits. I enjoyed reading the notes and it brought me to a new light of the FAR world. I will be using these notes to get a concrete understanding of each question headed my way. "The FAR notes are excellent! Each section provides the absolute must know information for exam day in a clear and concise manner. These notes are perfect for a final review before the exam. The notes are not overwhelming, unlike most FAR review books that include a lot of "filler". I've purchased other focus notes from various CPA review courses, but these are the best I've seen yet!" I found the Superfast CPA Far Review Notes to be helpful. They are a very condensed version of the stuff that you need to know which is helpful. I did find them a big long though. What I think would be really helpful in addition to these notes would be a cheat sheet. It would have must know formulas, journal entries and key terms. I think this would have really helped me and every time I try to make it I get so bogged down with little details that I lose sight of the quick cheat sheet. "Nate did a great job in summarizing the key points to remember. Sometimes other software review courses get overwhelming with the amount of material to remember, with all the nitty-gritty details. Those are helpful courses, but in times where pulling out a laptop and studying the software is inconvenient, these will make better use of your time since they focus on the bulk of the material that makes up the test, with the chances of getting nitty-gritty questions being low. The bullet format is my favorite; the presentation of the details of specific topics outlined in that fashion is easier to read and assimilate makes my job a lot easier. The Far notes are AMAZING. The information in them are laid out perfectly and cover the stuff you really need to know, in order to pass on the first try. I like how the notes did not include lots of formulas because as a math person you tend to know the formula and not the concept, but these notes help you learn the concept that makes the formula make sense. There is no need to memorize the formula once you understand the math behind what is going on. The Superfast CPA FAR notes were very helpful during my CPA Exam preparation. The notes are super organized and easy to understand. They gave me a better understanding of those hard topics for me such as non-for-profit and governmental accounting sections. Differences between IFRS and GAAP are also discussed on the notes. These notes covers all the topics required of FAR. I will highly recommend it to everyone taking the CPA FAR exam! "The SuperFast CPA Review Notes were a lifesaver. A well-organized and condensed series of concepts covered in the exam, it helped me quickly recap topics I studied up to two months earlier. Something the daily cumulative set of 30 questions don't cover systematically. The last confidence booster I needed to tackle the "beast" FAR section."